The APV DELTA mixproof valves from SPX are water hammer safe, stop and change-over valves that ensures safe separation of incompatible media via two valve seats. Depending on your application different mixproof valves are available - standard mixproof valves, double-seat ball valves or mixproof valves especially designed for CIP-applications. Various model offerings are available to meet the processing demands for brewery mix proof applications. Based on more than 25 years' experience in double-seat valve production, SPX now introduces the new APV DELTA DA3+ double-seat mixproof valve. Double seat ball valves APV DELTA DKR are proving their worth day by day in the fields of brewing, drinks technology, dairies and the food industry as well as in chemistry and pharmacology - worldwide! 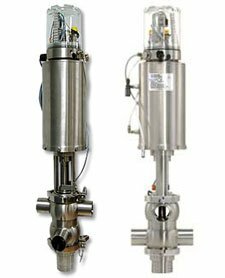 The APV DELTA SD4 and APV DELTA SDM4 valves are (double seal) safe flow valves designed for safe media separation applications in the food, beverage, dairy, pharmaceutical and chemical industries. The valve which is just right for applications which require safe liquid separation, but not necessarily seal cleaning. Mix Proof valves provide safe separation of dissimilar products within the same valve body. A great feature of the W30 Series is that the body and actuator arrangement are designed for high pressure applications. The W72 RS Series Mix Proof Valve features a lower radial seal for minimal spillage of products when opening or closing. Independent lifting of both upper and lower valve seats allow CIP solution to safely flow across each seat surface and the vent area. The W70 Series Mix Proof Valves for products containing large particulates. W75CP PMO Mix Proof Valves are for safe separation of product from CIP plus single seat-lift separation compliance. W75 for safe separation of product from CIP plus single seat-lift separation compliance. W75RS for safe separation of product from CIP plus single seat-lift separation compliance. W75CP for safe separation of product from CIP plus single seat-lift separation compliance.